Just so y'all know right off the bat, I'm a little punch drunk this morning because I had a bout of insomnia last night, so I'm not exactly firing on on cylinders. (You: "Are you ever?") If I say something that doesn't make sense (You: "Again..."), you'll have to forgive me. But you always do. Sorry in advance to the menfolk reading, but I am dealing with the beginnings of my TOM (or as my friend Desiree brilliantly calls it, Shark Week), so my hormones are raging and it's completely frustrating. For the last two days I've felt like I am in constant state of starvation and have absolutely no energy. I've had this insane urge to eat everything in the house. For the most part I have not, but yesterday I broke all the rules at dinner. I made the wonderfully yummy potato salad recipe from my Runner's World cookbook, and it's by far one of my fav recipes from it because it's just perfect in every way. Super tangy from the dressing, salty from the capers and tons of hot herb action from the mint/scallions. Long story short, I wolfed down my portion, and then said "F it" and went back and demolished most of the batch. Definitely no slow or moderate eating involved, I was in complete obsessive autopilot mode. I felt so uncomfortably full after dinner that I wanted to slap myself, but in another way it at least hushed to obsessive "I'm hungry, I'm hungry, I'm hungry" mantra going on in my brain. I don't feel terribly bad about it overall. I mean I do, obviously it's not good to overeat or get bingey, but I'm objective enough and know myself well enough to know that this was all hormone based. I've been doing everything right from a nutrition standpoint the last couple of days, I'm just genuinely hungry. This isn't something like Nutella or cold cereal where I will eat it obsessively until it's gone anytime it's in the house. This is just how I am for a couple of days before "Shark Week" begins, and I know it's temporary and will be over soon. All I can say is thank God we don't keep many treats or chips in the house. If all I have in the house to overeat is a healthy potato salad recipe, then I guess so be it. Speaking of Runner's World, I realized by the day's end that I had made something from my cookbook at each meal! I listed what I ate below, and thankfully there are links to everything I made so that you can enjoy them too! 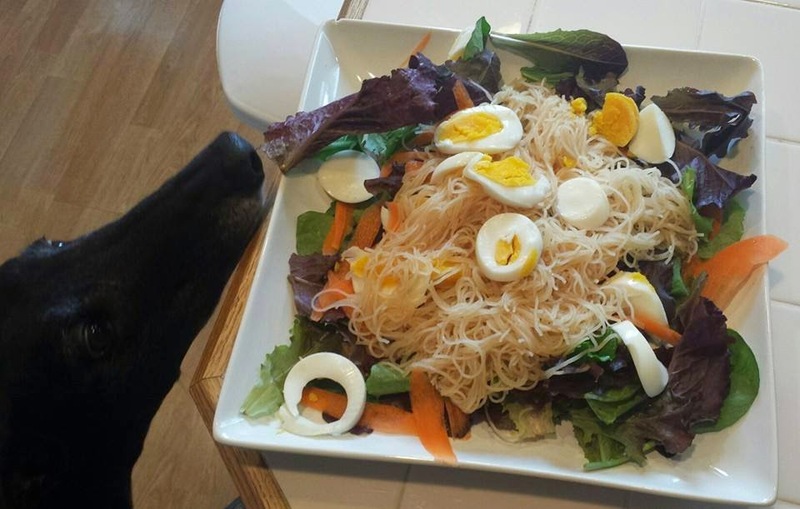 That Asian noodle salad was fantastic, although next time I would personally wilt the greens a little because the texture of them against soft noodles/eggs just didn't set well with me. You know what else didn't set well? That my dog is a complete turd and touched that piece of lettuce with her mouth, causing me to have to give in and give it to her because, germs. She is obsessed with lettuce! My plank was difficult yesterday but I managed to eek it out. I'm going to go on a long walk today because I haven't all week, and I'm feeling crabby after not exercising all week. I'm also feeling stressed and need to clear my head, so the walk will do me good. I'm going to try for a longer run this weekend. With all due respect, and I do respect science, the group of "strenuous runners" used in the study was very small compared to the casual jogger/couch sitter sample. Like, 40 fast runners vs hundreds of casual runners difference in sampling. Runner's World had a breakdown of the numbers and I think the amount of deaths in the fast runner group was two. Yes, two people, and there was no specific "this is what killed them" cause. In my opinion, it's not a large enough sampling to really conclude that running faster or more than the average person is harmful. If you use a larger sample set and it's equal on both sides, then we can start having a more serious conversation about it. Do Americans really need yet another excuse to not exercise? I mean love America and everything, but we already trend towards being lazy and unhealthy, and the average American isn't going to read beyond the headline that running is bad for you. They aren't going to see that the numbers in the study are a bit questionable, they're just going to go with headline "running is bad for you". Some articles I read actually said that runners had the same health stats as those sitting on the couch. Oy vey. At the end of the day, even if the study was dead on, you have to weigh quality over quantity. Does getting out and running fast or often make you feel good? Do you feel you are living life to the fullest? I would personally rather be outside doing something I love every day and have a few less years than to be sitting on the couch feeling fat and worthless. That's just me. Now if you'll excuse me, I've got to get off my tail and actually go move my body! Yum new recipes! Sorry you ate almost the whole batch of potato salad. Better than french fries, I suppose. Damn hormones.